I'm currently writing this whilst the sun is shining, which is bazaar as it's now autumn! Autumn is my favorite part of the year, crunchy leaves, rainy weather and endless hot chocolates. 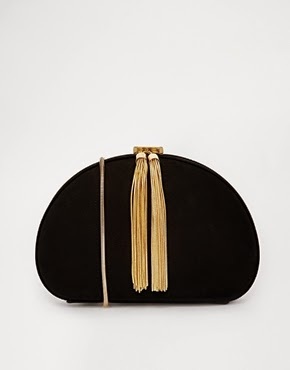 I have been loving the fashion recently that has wondered it's way onto my computer screen, therefore I thought I'd show you a snippet of some of my A//W must haves! 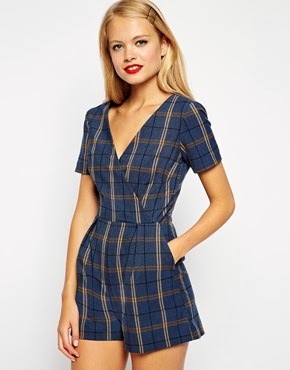 How AMAZING is this playsuit from ASOS? I love the check print throughout piece, I think this would be great for a lunch out or shopping trip! I love the wrap around v neck as I think it makes the outfit look mature alongside the colour choices which scream Autumn. Tartan scarves are hugely popular right now and this one is my favorite! 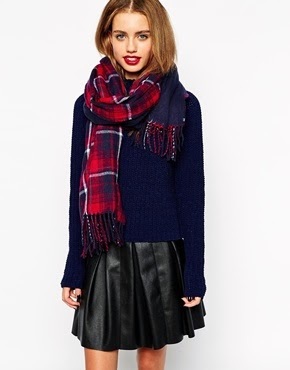 From New Look it comes in as one of cheapest tartan scarves I've seen on the high street. Using navy blue as the base colour with the classic print is such a big hit this year! I've recently been loving the long duster coat trends, whether its a pretty pastel colour to a classy grey I love it! 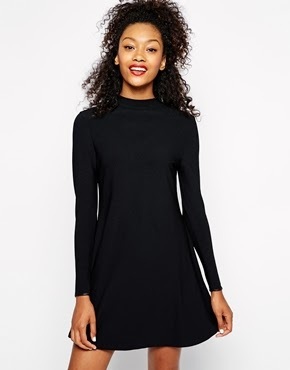 This one from ASOS is my favorite, a simple grey/ white specked material, stretching down just above the knees, would look perfectly for any occasion.